Welcome to "Broadway Bound!" sponsored by Hambo Stamps! Today Hambo customers and the Bacon Bits Design Team are bringing you fun creations that depict Broadway show titles! It might be our favourite, or just one that was fun to design. If you arrived here from Paula's blog you are in the right place! If not, you might want to start back at the beginning at the Hambo blog to make sure you are eligible for the hopper prize! A prize will be awarded to one participant whose Broadway-themed creation tickles the Bacon Bits’ fancy in a hammin’ jammin’ way! Another prize will be awarded randomly to a hopper who comments on all of the blogs along the way. The winners will be announced on the Hambo company blog, Talk to the Ham, on Tuesday, September 25. We love comments anytime, but the deadline for prize entry comments is Sunday, September 23 at 5 PM CST. Don't miss it! I used the adorable digital stamp from Hambo, know simply as "boat". I added some die-cut waves (one in-behind the boat and two in front), and then paper pieced the boat, sails and sailor, adding lots of color with my markers and sponges. I know ... his hair should have been gray (since he's the Old Man part of the play) ... instead, I made him a bleached blonde. :) Hope you like. Now dance on over to Judy's blog for another great Broadway show! Wow great card Loll, clean and simple yet wonderfully detailed with your paper piecing and waves. I love it! 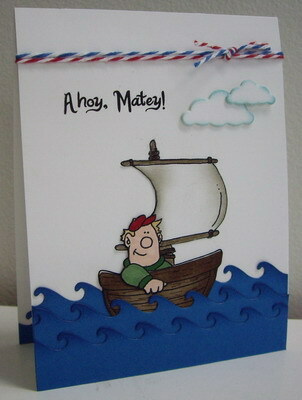 Fantastic card-- the waves look awesome and I think it's hilarious that he's a bleached blonde :) Love it! I'm amazed that we all chose different plays without comparing notes with each other! Your show choice and digi are perfect, and I love the dimension to the sail that your shading gives! Wonderful! Love all the dimensions going on in this card. Your clouds are just too cute! Very cute! I love the dimension of the waves!! Such a cute card! I love the digi and those die cut waves look just like the type of scenery you'd see in a stage show! Cute card. I love the waves & what a perfect sentiment too. Loll, love all your stuff! This is a great card. Love the water. OHHHH Loll, this is so CUUUUUUTE, I havent seen old man and the sea, but I just love love love your card, this is one of my favorite Hambo images and you have made it come to life, you never fail to make me look in awe at your work. Very cute image for this show. The water came out fantastic and the twine is a perfect finishing touch! Your die-cut waves rock! Awesome card! Cute card. I love those waves. They're awesome. Those waves rally make your card pop!! Great design for a great show! Totally fabulous! Love the waves and your awesome piecing! Thanks for hopping with us today! He is so dang cute in that weddle boat!! This is just tooooo cute! I like the clouds and how the boat is in the waves. Great job!! This is adorable! Love the waves and the clouds - great touches! What a fun card! I love the way you placed the waves and the paper piecing. Super card, Loll. Always love seeing your work!!!!! So adorable, Loll! The waves, the clouds and that little guy is just precious! Love your card, your dies, your colouring...everything!!! Oh, I love your card, Loll!! Your image is colored just perfectly, and I love it tucked in those waves!! Just great! so fun! Totally awesome man/fun card! Love it Loll!